I am a quasi-food blogger. I have no desire to make it a life calling, prose doesn’t come easily and I haven’t the skill, courage nor conviction to create recipes. I wish I could write like Mel of Treehouse Kitchen, be a mistress of my foodie domain like Alli of Pease Pudding or have creative nous like the Brash sisters of Greet & Eat. My goal is simply to be a better cook, and learn from those more accomplished. I just want to entertain well, and be one of those people who can whip up a delicious feast for 8 with a 2-hour notice. I am not there yet, but I am certainly closer than I was before I started the blog. Writing a blog has enabled me to learn new flavour combinations, try new cuisines, ask more questions and for some obscure reason, allowed me to acquire 12 wooden cooking implements. It’s such a uniting topic; – everyone is happy to talk about food, be it their favourite restaurant, a family recipe or just a food memory. There is no right or wrong food preference, though I concede that there are odd and intriguing ones. I haven’t the foggiest where this will take me, but so far, the journey has been exciting and fun. The best part is that it has allowed me a peek into the world of foodies, bloggers and artisan food producers. What does all that have to do with pecan shortbread? Nothing. I admit that shortbreads are among my favourite baked goods, and pecans are quickly becoming my favourite nuts to cook with; when lightly toasted, they take on a caramel taste. In these cookies, the caramel taste is enhanced by brown sugar. These are comfort cookies, crumbly, buttery, nutty and totally irresistible. I made these 3 days before Christmas, and they never even made it to Christmas. Modified from Dorie Greenspan’s Baking: From my Kitchen to Yours. Process toasted pecans with ½ cup plain flour until fine. Put aside. Sift together the rest of the flour, corn flour and salt. Beat brown sugar and butter until creamy. Add in the flour mixture, and just mix in. Fold in the pecan flour. The flour is very soft at this stage and tricky to work with. Ms Greenspan’s tip is to use a large zip-lock plastic bag and roll the dough into a flat rectangle 0.5cm thick, lifting the plastic from the dough as you roll to remove creases. You could also use sheets of baking paper. I use this or plastic wrap to shape the dough into a long cuboid. Refrigerate the dough for at least 2 hours or overnight. Heat oven to 175°C. Line two baking trays with baking paper. 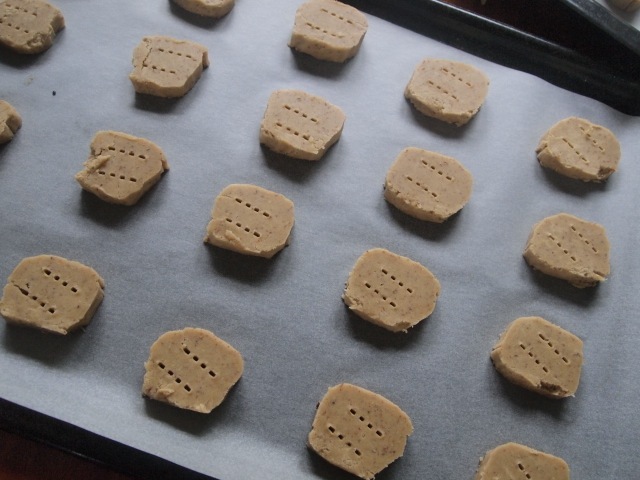 Cut the dough into squares. Prick with fork, ensuring the tines go all the way through. Bake for 20 mins, rotating the trays at midpoint. Cool the cookies on a rack. I'll have to try this, Chin. Along with your pork belly recipe. Which Ottolenghi book did you get? I've been to 2 of his delis. They're good but I wouldn't say I was wowed by the food. His other restaurant, Nopi was far far better. Hi Li, I have all three Ottolgenhi books, but I've only cooked from the first two. His recipes have been the most successful for dinner parties, probably because they are just a tad different and really colourful. Ooo…must go with you to Nopi next time I'm in the UK.